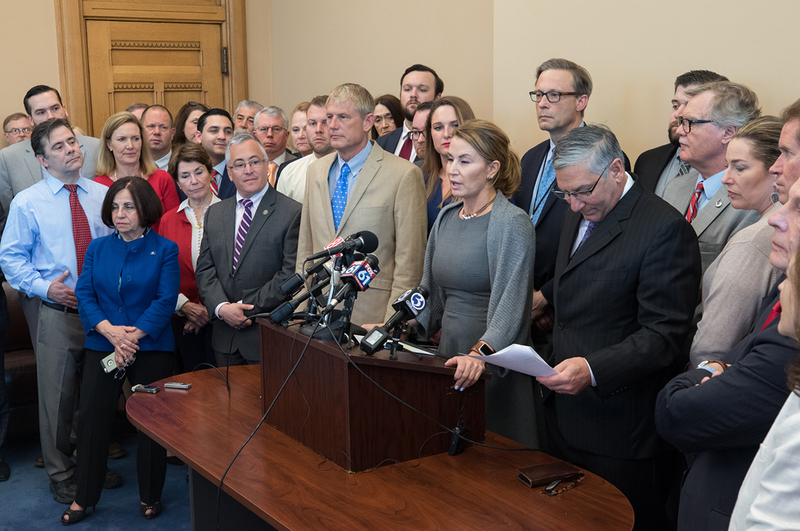 HARTFORD – Today Republican lawmakers released their second complete balanced budget proposal this year to stabilize the state budget in fiscal year 2019 and beyond. The revised Republican proposal takes into consideration the revised projected deficit, the impact of a delay in federal hospital reimbursements which will boost revenue in fiscal year 2019 by over $400 million, and the need to restore the Medicare Savings Program in full. This revised plan fully balances next year’s budget, reduces future deficits, restores funding for the core functions of government, and does not include any new tax increases. It also implements policies to achieve long-term savings to create stability and predictability in future years. “We’ve taken into consideration feedback from lawmakers on both sides of the aisle and we believe this revised budget is something both Republicans and Democrats can get behind as a pathway forward for our state,” said Senator Paul Formica (R-East Lyme) and Representative Melissa Ziobron (R-East Haddam), co-chair and ranking member of the state’s Appropriations Committee. Recognizing the impact of the hospital deal delay and updated numbers, this revised budget would restore additional funding to core services beyond the initial Republican budget proposed in the Appropriations Committee. It would allow for full restoration of the Medicare Savings Program, additional funding for the Retired Teachers’ Health Care Fund, and eliminate certain savings that were criticized by Democrats in an effort to build consensus and garner bipartisan support. In addition, it contains no new tax increases, results in a surplus in fiscal year 2019 of $17 million, and contains policy recommendations that reduce the fiscal year 2020 deficit by $800 million. After mitigating the fiscal year 2018 deficit utilizing revenue in the state’s budget reserve fund, this plan will still leave the state’s rainy day fund with $864.5 million at the end of fiscal year 2019.